Kawasi Lakhma is an Adivasi just like tens of thousands of other Adivasis caught in the war raging in central India. Yet, he is not just like them. He is an MLA as well, albeit of the Indian National Congress, the party in opposition in Chhattisgarh. He was a part of the Congress caravan that got brutally attacked by the Maoists and lost many of the participants, state and national level leaders included, to the rebel bullets. Not merely a part of it, he was in fact among those who formed the front lines of Parivartan Yatra that came under fire. He was travelling, as per chaotic and often contradictory reports masquerading as media reports, in the third car of the caravan with none less than Nand Kishore Patel, president of the state unit of the Congress and his son. He was abducted together with them and taken to the jungle where the father son duo was brutally killed. He was let off like many others who were accompanying Mahendra Karma. It is just that unlike all others who were let off, he became a target of conspiracy theories being planted in media. No one asked why Sattar Ali, a prominent leader of Salwa Judum and lieutenant of Karma, was let off. Lakhma does not enjoy the luxury. He cannot. He is an adivasi and therefore a perennial suspect after all. His loyalties would never be unquestionable despite him having chosen to side with the state in this war being waged for the corporations. That is where this war is poised, unfortunately. That is what has pushed the war into a standoff that seems much easier to be sustained than resolved. No, the suspicions do not justify this dastardly attack and killings. Killings are, and will always be, despicable as they dehumanize everyone. They dehumanize the killer, the killed and the onlooker including the distant ones watching the horror on the television screens in the relative safety of their drawing rooms alike. Killings are despicable as they take away a bit of all that the humanity has achieved against all odds. And this is why the Maoist ambush of Congress’ Parivartan Rally returning from Sukma is an appalling act and should be condemned unequivocally. Nothing justifies the ambush that killed 22 people including many innocents. 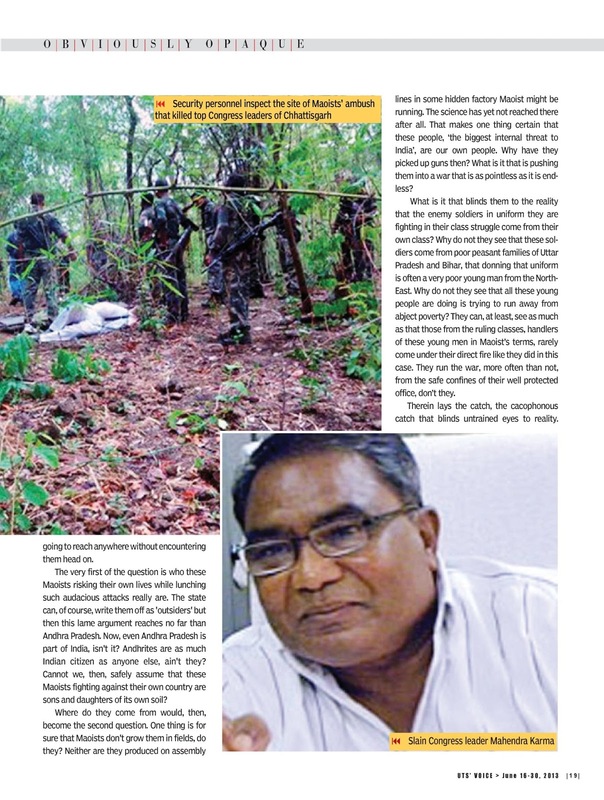 Nothing absolves the Maoists of the crime, not even the presence of a certain Mr. Mahendra Karma whose private militia was declared a killing machine by the honourable Supreme Court which has then illegalized and disbanded the militia. This is not because Mahendra Karma is not a convicted, judging by that criteria hardly any criminals are found behind bars in our country. Karma's involvement in killings and rapes carried out by the now illegal Salwa Judum is undeniable. Yet, that does not give anyone the right to kill him, definitely not the maoists. As it is, not only the law of the land but the very philosophy of justice prohibits anyone from taking life of someone else. Having said that, let's concede that the ambush posits many uncomfortable questions in front of us. These are the questions that open the road to reconciliation and we are not going to reach anywhere without encountering them head on. The very first of the question is who these Maoists who risk their own lives while launching such audacious attacks really are. The state can, of course write them off as 'outsiders' but then this lame argument reaches no far than Andhra Pradesh. Now, even Andhra Pradesh is part of India, isn't it? Andhrites are as much Indian citizen as anyone else, ain't they? Cannot we, then, safely assume that these maoists fighting against their own country are sons and daughters of its own soil? Where do they come from would, then, become the second question. One thing's for sure that maoists don't grow them in fields, do they? Neither are they produced on assembly lines in some hidden factory Maoist might be running. The science has yet not reached there after all. That makes one thing certain that these people, the biggest internal threat to India, are our own people. Why have they picked up guns then? What is it that is pushing them into a war that is as pointless as it is endless? What is it that blinds them to the reality that the enemy soldiers in uniform they are fighting in their class struggle comes from their own class? Why do not they see that these soldiers come from poor peasant families of Uttar Pradesh and Bihar, that donning that uniform is often a very poor young man from the North East. Why do not they see that all these young people are doing is trying to run away from abject poverty? They can, at least, see as much as that those from the ruling classes, handlers of these young men in Maoist terms, rarely come under their direct fire like they did in this case. They run the war, more often than not, from the safe confines of their well protected office, don't they. Therein lays the catch, the cacophonous catch that blinds untrained eyes to reality. Think of the reactions to this ambush and one would know what I am referring to. Think of the Chintalnar massacre of 76 CRPF soldiers in Dantewada that took place in April 2010. Nothing can be sadder than comparing tragedies but then count the dead in both of these attacks. Think, now, why that attack was not dubbed as an attack on the democracy like this one? Is it just because the young soldiers killed were foot soldiers and not the political leadership? Is it because the ‘democracy’ has come to reside in the person, and personal security, of politicians? Now, think of the urbane middle class seething in rage on the anger manufactured by jingoistic anchors. Look at their faces and you would find that their (cat)calls of avenging the ‘attack on the democracy’ are almost absolutely similar to their anger against the politicians that has been inflicted on television screens across the country in those now forgotten Anna Hazare days. Do they have a moral right even to speak on the issue, forget the high talk of revenge; they might not know even the meaning of revenge after all. They are the ones, unfortunately, who would set the tone of the revenge the state strives for. It is just that the ambush will be avenged on the cost of the lives of poor, hapless young citizens coming from the countryside and not on that of their own kith and kin. It is very easy to fight a war where the blood would be shed by others and not your own, isn't it? Cheering such wars gives more thrill than a ‘bloody’ IPL match which might be ‘fixed’ in any case, no? And then, a peaceful resolution of the war within would affect none more than this middle class and the luxuries it cannot live without. 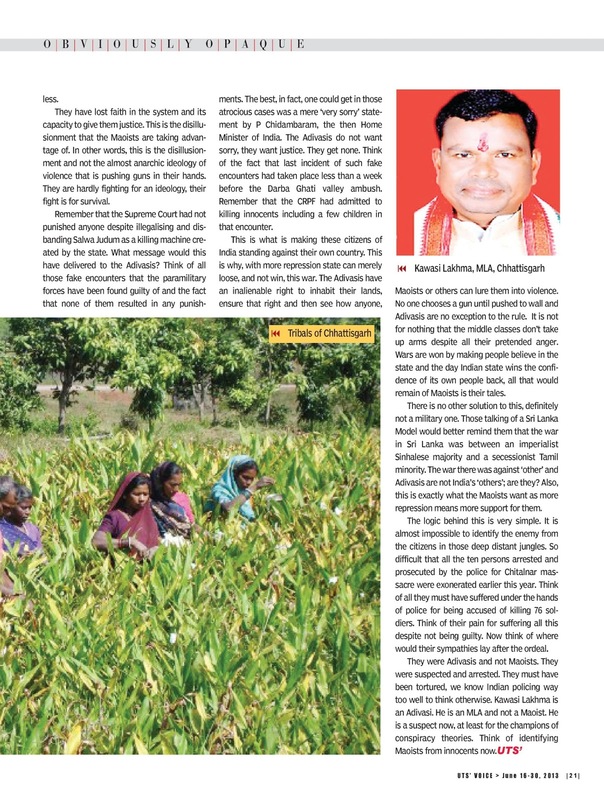 Forget luxuries, they would not get even water and electricity without sacrificing the adivasis at the altar of development and they know it way too well. This is why displacement of adivasis, forced evictions from their own lands does never bother them. It does bother the adivasis, though. This is what has disillusioned them completely from the state. The disillusionment has been born out of the sad realisation that Indian state has stopped listening to the peaceful and non violent voices of resistance. Unlike urban middle classes’ obliviousness to the developments, the advasis have noticed how the governments have drowned the people of Narmada valley despite not only of their decades long peaceful protests. 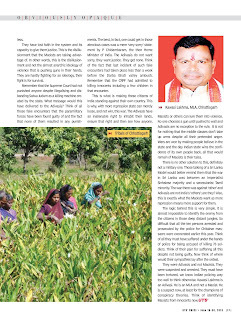 They have silently seen how the governments have rubbished the Supreme Court’s decision of not displacing them until compensating them with land for land in the process. 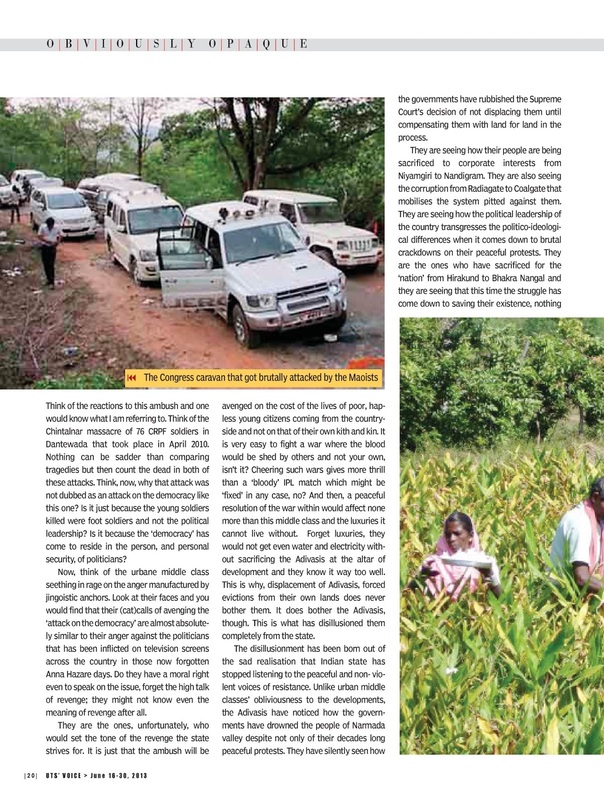 They are seeing how their people are being sacrificed to corporate interests from Niyamgiri to Nandigram. They are also seeing the corruption from Radiagate to Coalgate that mobilises the system pitted against them. They are seeing how the political leadership of the country transgresses the politico-ideological differences when it comes down to brutal crackdowns on their peaceful protests. They are the ones who have sacrificed for the ‘nation’ from Hirakund to Bhakra Nangal and they are seeing that this time the struggle has come down to saving their existence, nothing less. They have lost faith in the system and its capacity to give them justice. This is the disillusionment that the Maoists are taking advantage of. In other words, this is the disillusionment and not the almost anarchic ideology of violence that is pushing guns in their hands. They are hardly fighting for an ideology, their fight is for survival. Remember that the Supreme Court had not punished anyone despite illegalising and disbanding Salwa Judum as a killing machine created y the state. What message would this have delivered to the adivasis? Think of all those fake encounters that the paramilitary forces have been found guilty of and the fact that none of them resulted in any punishments. The best, in fact, one could get in those atrocious cases was a mere ‘very sorry’ statement by P Chidambaram, the Home Minister of India. The adivasis do not want sorry, they want justice. They get none. Think of the fact that last incident of such fake enconters had taken place less than a week before the Darba Ghati valley ambush. Remember that the CRPF had admitted to killing innocents including a few children in that encounter. This is what is making these citizens of India standing against their own country. This is why, with more repression state can merely loose, and not win, this war. The adivasis have an inalienable right to inhabit their lands, ensure that right and then see how anyone, Maoists or others can lure them into violence. 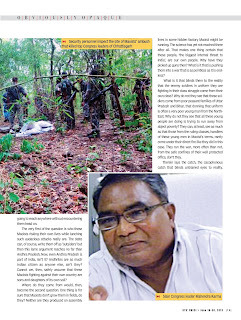 No one chooses a gun until pushed to wall and adivasis are no exception to the rule. It is not for nothing that the middle classes don't take up arms despite all their pretended anger. 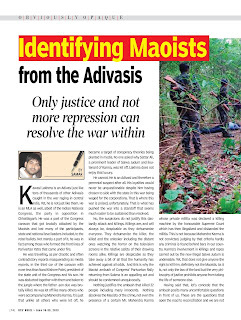 Wars are won by making people believe in the state and the day Indian state wins the confidence of its own people back, all that would remain of Maoists is their tales. There is no other solution to this, definitely not a military one. Those talking of a Sri Lankan Model would better remind them that the war in Sri Lanka was between an imperialist Sinhalese majority and a secessionist Tamil minority. 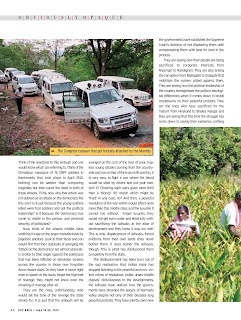 The war there against ‘other’ and adivasis are not India’s ‘others’; are they? Also, this is exactly what the Maoists want as more repression means more support for them. The logic behind this is very simple. It is almost impossible to identify the enemy from the citizens in those deep distant jungles. So difficult that all the ten persons arrested and prosecuted by the police for Chitalnar massacre were exonerated earlier this year. Think of all they must have suffered under the hands of police for being accused of killing 76 soldiers. Think of their pain of suffering all this despite not being guilty. Now think of where would their sympathies lay after the ordeal. 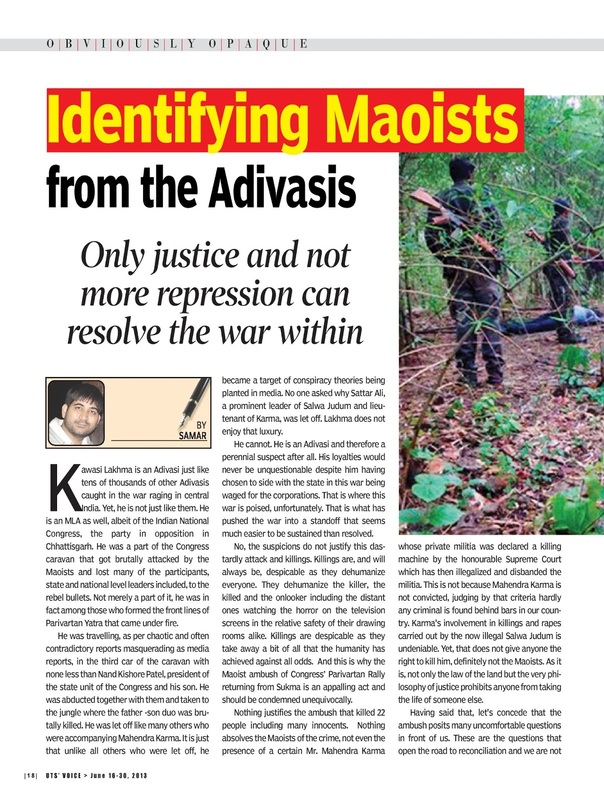 They were adivasis and not Maoists. They were suspected and arrested. They must have been tortured, we know Indian policing way too well to think otherwise. Kawasi Lakhma is an adivasi. He is an MLA and not a Maoist. He is a suspect now, at least for the champions of conspiracy theories. Think of identifying Maoists from innocents now.